Sometimes we install some drivers or softwares that slows down our computer, same is the case when we goes through the registry editor and make some changes in the registry editor For instance you want to disable or enable usb ports in your computer for which you need changes In reg editor , but what if these types of changes harms your computer? i.e what you will do if the changes you made create a problem, the changes you made was incorrect, or anything else, so in that case you should use the windows system restore point as a backup, because you can get back to the windows with the previous settings where you created the system restore point. 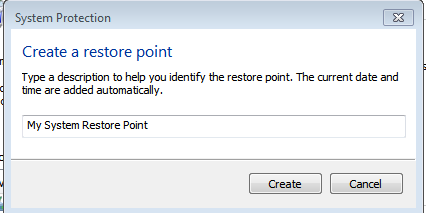 That why you need to create a restore point in windows pc, so you will be able to get back to the previous settings. 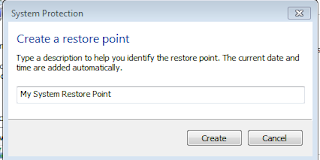 You can create a restore point in windows 7, 8 and vista. 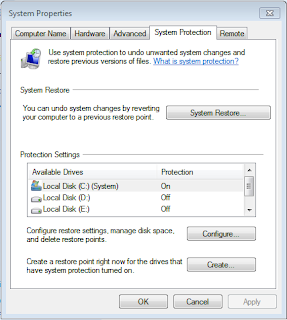 Procedure of creating a restore point in windows 7 and 8 is nearly same. But we’ll share the procedure for both so keep reading the post. Step-1: First of all you’ve to right click on “Computer” from desktop and select the properties from the drop down list. Step-2: Now in a new window you’ll see details about your computer system, you’ve to select the “System protection” from the right panel. Step-3: A new little window pops-up where you’ve to switch to ‘system protection’ tab. Here you’ve nothing to do anymore, what you’ve to do is to click on “Create” button as you see in the below picture. Step-4: After clicking on create button, a new little box will pop-up asking you to enter a short description for your restore point, that is for how you’ll identify this restore point. Because you can create more than one restore points. So enter something that you should identify later. You don’t need to add time & date but system adds current time automatically. So finally click on Create button. A new little box opens up with a progress which completes shortly and you get a message that “System restore point created successfully”. As earlier we said that the method for both windows 7 and 8 is same the difference is just that, in windows 8 you have to search for “System Protection” in the search bar at the start screen. You will get a result like that “Create a restore point” now you’ve to click on this and then do the same as we discussed above, i.e click on ‘Create’ Enter a description and then again click on create button. So you’ll see a message after completion. 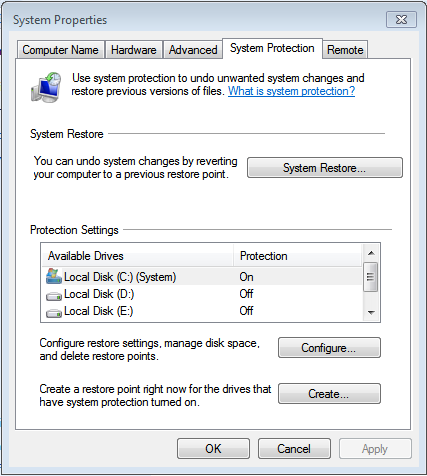 Now if you’ve a (or many) restore point(s) and wondering that how to restore to the previous system files and settings then don’t worry, it is very easy if you created a restore point, What you’ve to do is to again right click on computer and go to ‘system protection’ tab, now here you have to click on “Restore point”, after that select “Use different restore point” from the new window, after selecting you’ve to follow the wizard. We’ll be discussing this topic in details and will bring you screenshots for better understanding. So stay in touch with us. Tip: You can get our new posts through your email so follow us via email to get new posts. So Above we mentioned the method of creating and then using a system restore point on your windows, I hope this will help you in backing up your windows if something goes wrong! Also share this post with your friends and let they also create a system restore point in their windows. Stay tunned with us to get more informative post from us!